The Suisun City Fire Department recommends smoke detector batteries be checked at least twice a year when daylight savings starts and ends. All smoke detectors 10 years or older should be replaced with a new long-life model required in California. Smoke detectors are a simple and affordable device that every dwelling should have to alert residents to life-threatening smoke and fire. Smoke detectors are effective in giving residents sufficient notice to evacuate a dangerous situation. All smoke alarms sold in California are now required to be sealed-battery models with a minimum life of 10 years. They also must have the date of manufacture, a place to note when the unit was installed and a hush button to silence nuisance alarms from non-emergency situations, such as burning toast or steam from a shower. Approximately two-thirds of home fire deaths occur in homes without working smoke alarms. Since most fatal fires occur at night, it’s essential that every home has working smoke alarms to provide an early warning. Working smoke alarms increase the chance of surviving a home fire by 50 percent. Install smoke alarms in every bedroom, in the hallways leading to the bedrooms, and on each level of your home, including the basement. 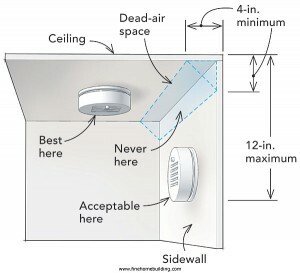 Smoke alarms should be mounted on the ceiling 4” from the wall; wall mounts should be 4-12”from the ceiling. Do not install near draft areas (windows, vents). Smoke detectors and carbon monoxide detectors are now required in California homes, particularly in new construction or in dwellings that have had $1,000 in remodeling or other permitted construction work performed. These detectors are available in single purpose and combination (both smoke and carbon monoxide) models. 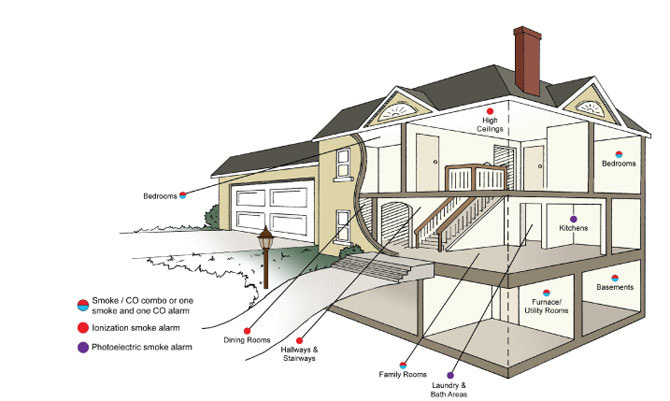 The diagram below shows where these detectors should be placed throughout a dwelling. The Suisun City Fire Department supports prevention, planning and safety enhancement to safeguard residents, their homes and our community. The Suisun City Fire Department is now accepting applications from anyone interested in serving as a Volunteer Firefighter online through the Human Resources page and Calopps.org.